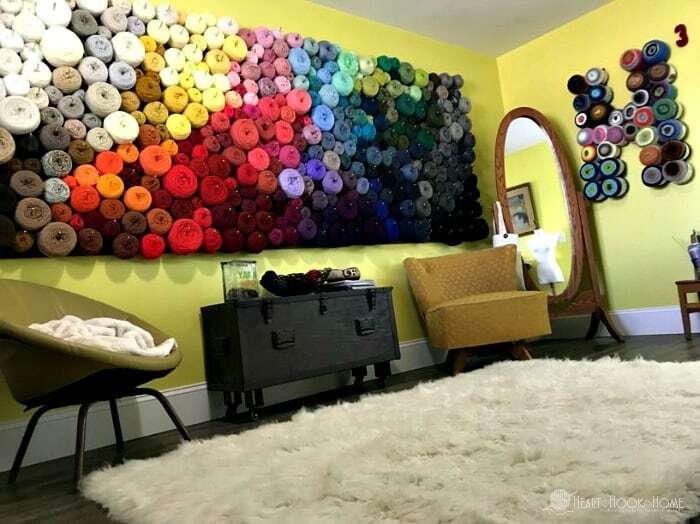 Are you obsessed with yarn and all things yarn related? I know every room in our home is covered with half finshed projects, half used skeins, and random crafting equipment. 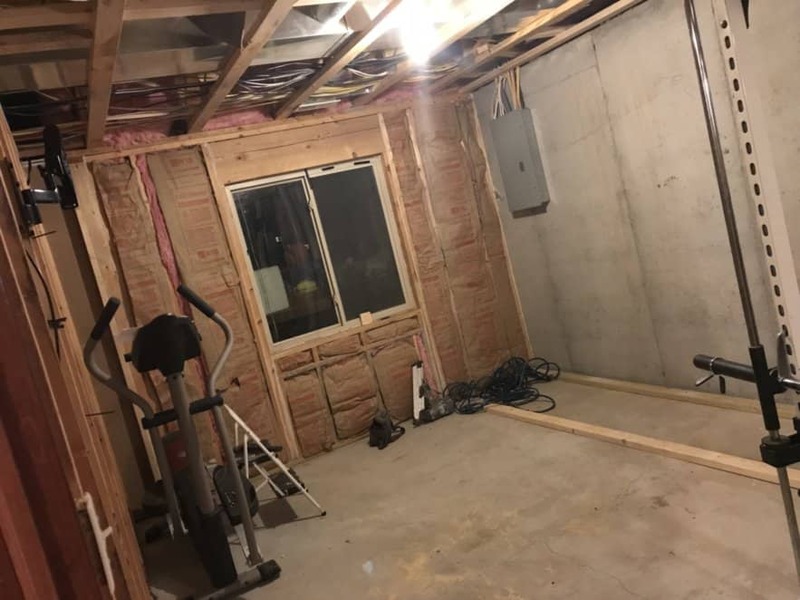 It wasn’t too hard to convince my husband that I needed to turn the last unfinished room in our basement (formerly known as the storage room) into my YARN ROOM. After a month of playing with and working in said room, I’ve finally had the chance to take photos and show you exactly the dream space I’ve created! This adventure has been five whole years in the making. Five years ago (over Christmas break 2012) my younger brother Forrest taught me to crochet. His high school girlfriend’s mother taught him back in the late 90’s, and he has since taught dozens of people (including my sister and me!) which, in turn, has resulted in THOUSANDS of new crocheters thanks to YouTube. What I remember most about that first night, as I was learning, getting frustrated at my yarn’s tangles and wonky stitches, he stopped, turned to me and said “It’s just one string of yarn. 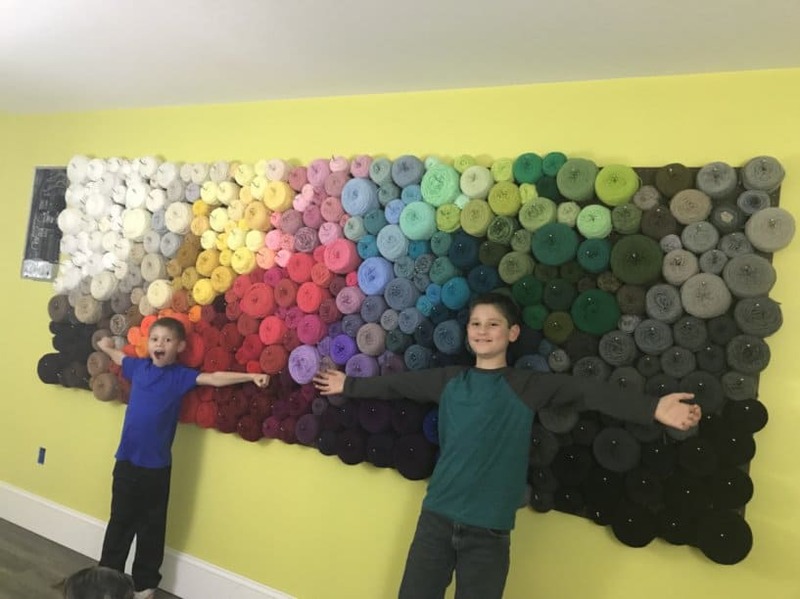 You can’t screw it up so badly that you can’t rip it out and try again.” I haven’t been able to put down the hook since, and it is fair to say that this whole yarn thing has turned into a slight obsession. Before this room was transformed into my dream yarn room, it was an unfinished storage room crammed full of our accumulated crap from our 12 years together. The hubbs was amazing and took several loads to donate and the rest of the junk to the dump. 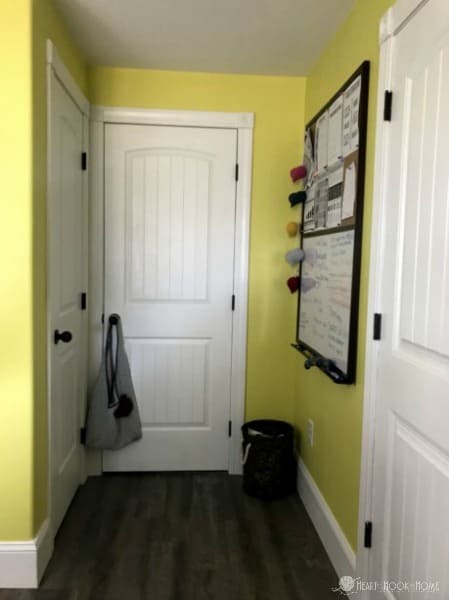 If you watch my weekly live videos on my Faceook page, you’ll know that I either sit at my desk and crochet or I’m up and moving around the room as we chit chat. I’ve been promising to take photos of my creative space/office/yarn room for weeks now, and I was finally able to get this done today! 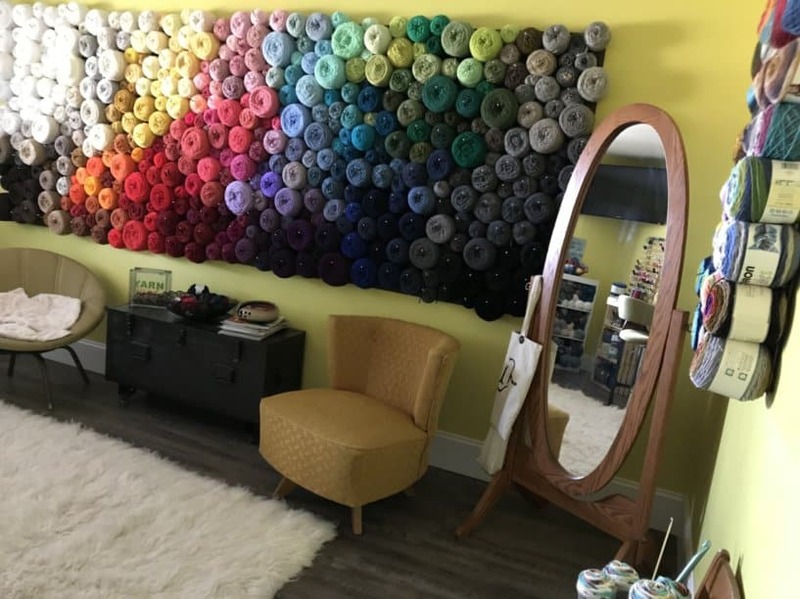 In this blog post, I will take you on a virtual tour of my office/yarn room. 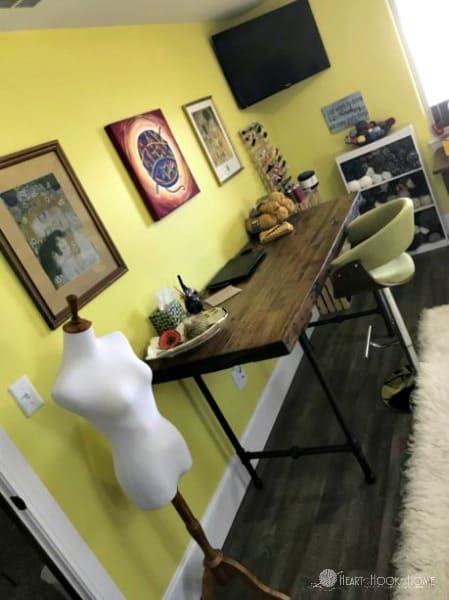 I hope you love it and gain some inspiration for your own crafting space! 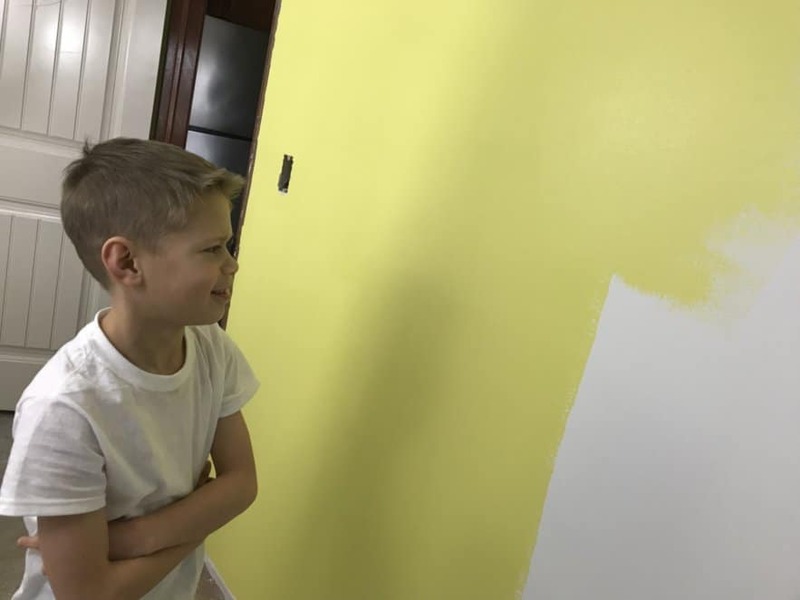 My youngest was not too excited about the wall color at first. Ha! 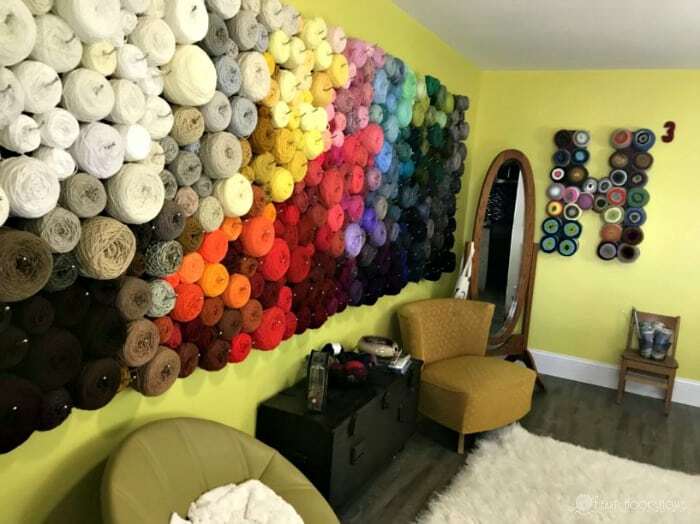 I added on to my original yarn wall, increasing it from 4′ x 7′ to 4′ x 11′. I don’t even know how many hundreds of cakes are up there, but I do know that I pull from the yarn as needed (for small projects) and I rearrange/reorganize/replenish as needed. It does not collect dust, and we do not have cats. It’s living art and the masterpiece of the space! 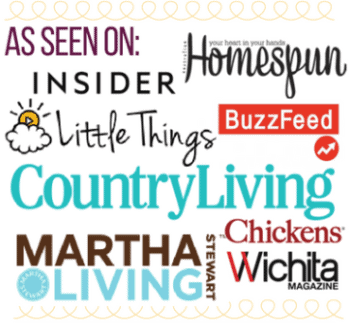 Here’s how to make one, they are suprisingly inexpensive to make – and free up lots of space on shelves, cubbies, and book shelves! This is a chair my mother gave me, that she used herself as a child. All throughout my childhood this was a plant stand (it’s a child size chair) but now it holds prominent position as the coveted Painted Canyon yarn holder. 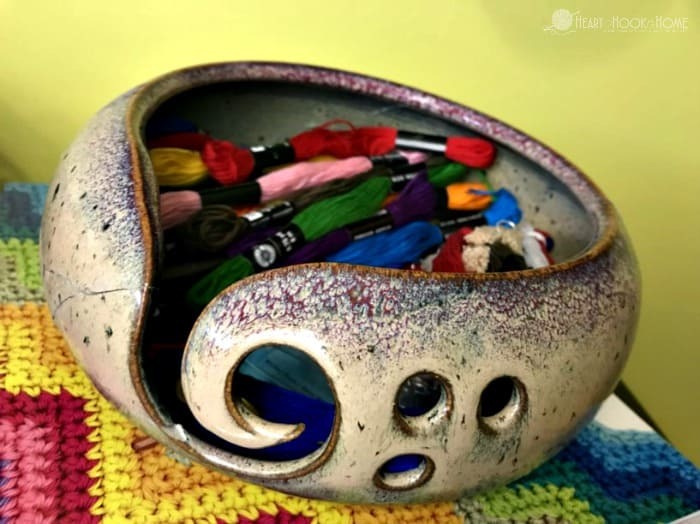 Several years back – after my afinity for yarn was apparent – my husband purchased this yarn bowl as a Christmas gift on Etsy. It has been broken (by my much-loved, not-so-gentle oldest child), but I was able to glue it back together (sans one chip) and now this is more of a decorative piece. I was glad I was able to save it at all! While hunting for flooring for this room, we found one of these piggy bank glass blocks. 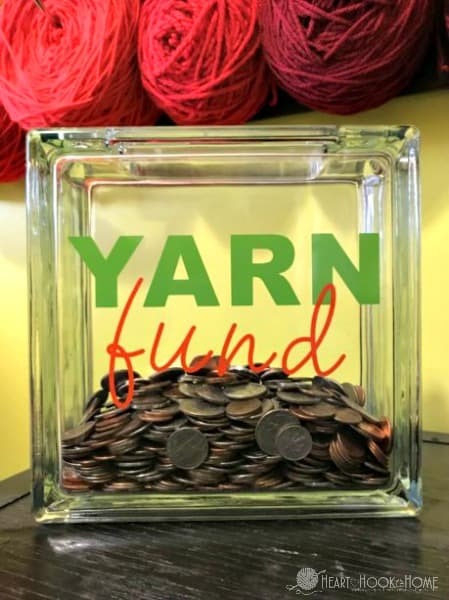 I used our Cricut machine to create a SVG file of “YARN fund”. If you’d like the file, let me know! 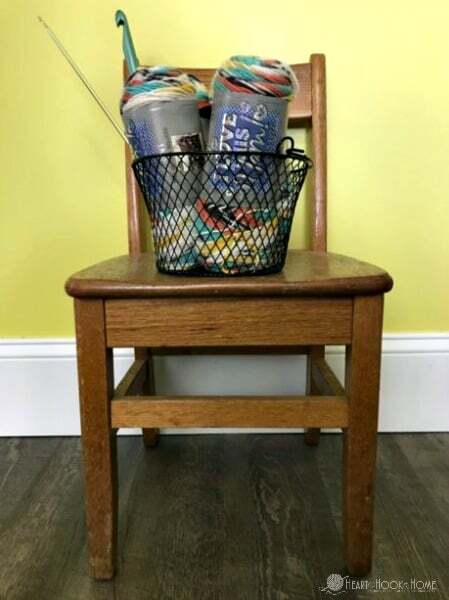 These two chairs are relics from Paul’s childhood. Both we inherited from his Grandmother’s house after she passed, and I am so happy they have a new home and are once again being used and loved. My good friend and long-time coworker Amanda is a fantastic artist, so I commissioned this yarn ball painting from her. She did not disappoint! One of my favorite artists of all time is Gustav Klimt. 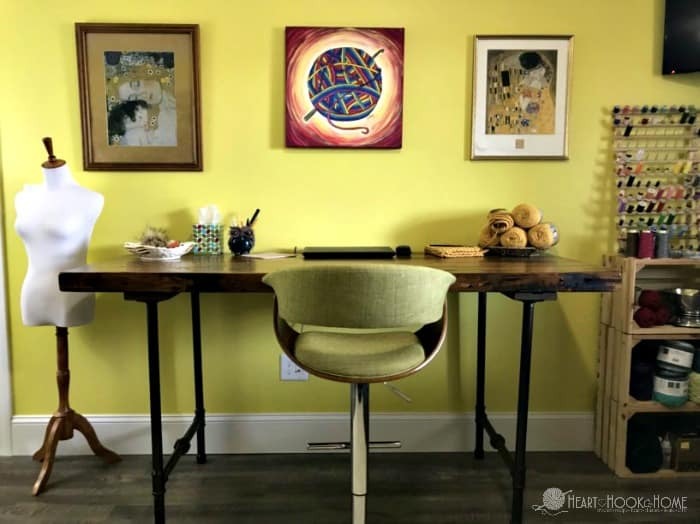 The two paintings on either side of the yarn ball painting are Klimt paintings that I have owned for decades. 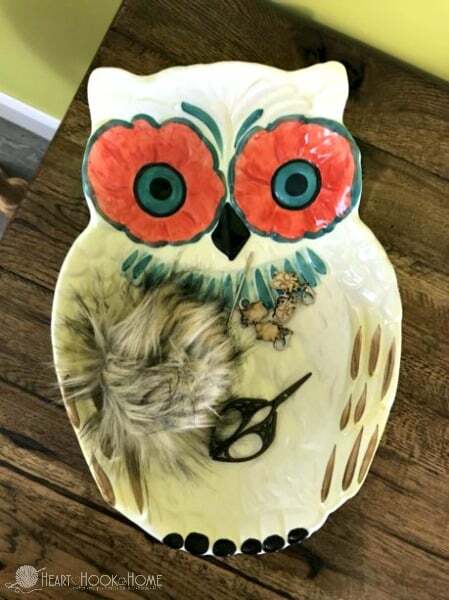 I have a slight obsession with owls, and Paul was not too excited when I went crazy over this platter at Gordman’s a few years back. Yes, I still bought it, and now it has the perfect home on my desk. 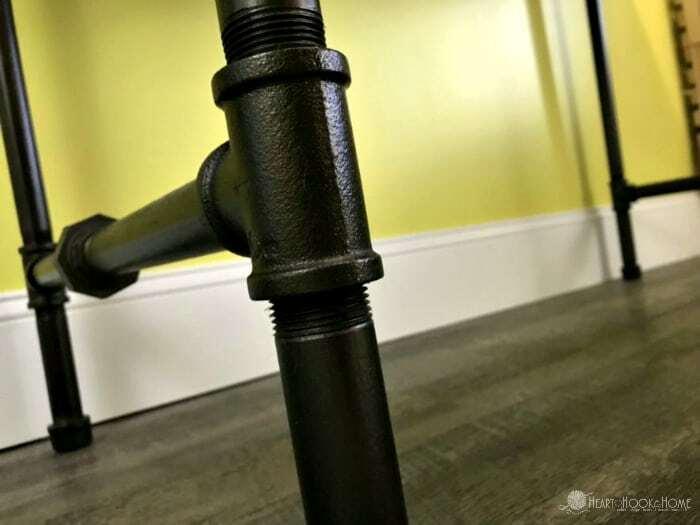 I like to stand while I work, and finding a raising desk for less than a small fortune was nearly impossible, so we commissioned our neighbor to make this desk out of 4″ thick oak industrial pallet wood and industrial piping. He did an amazing job! 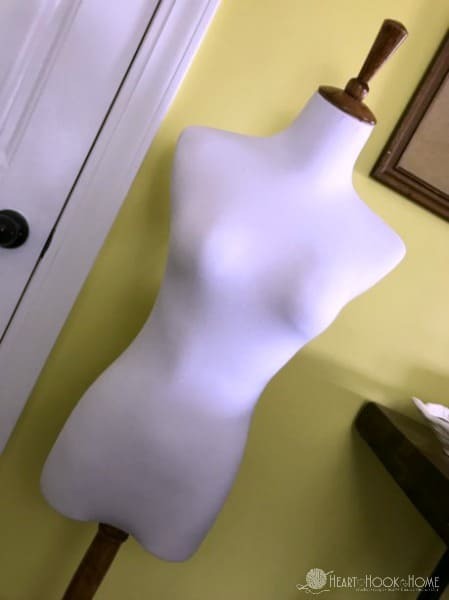 My mannequin Catherine is named after Catherine Howard, the fifth (and second beheaded) wife of King Henry VIII. I picked her up for less than $45 on Amazon, but that seller has since closed shop. 🙁 I have found a similar model for a similar price, so this is worth checking into if you’re in the market! I finally have my dry erase board and cork board that I use to write upcoming designs/articles/videos/posts I need to create. I can not express how much I love this board. Me and all my office supply loving glory. In the basket in the corner I have a collection of old yarn labels I’ve been accumulating. Some are older than others, but once I ammass enough I plan to decoupage my old sewing table. When that happens I’ll be sure to share the process! 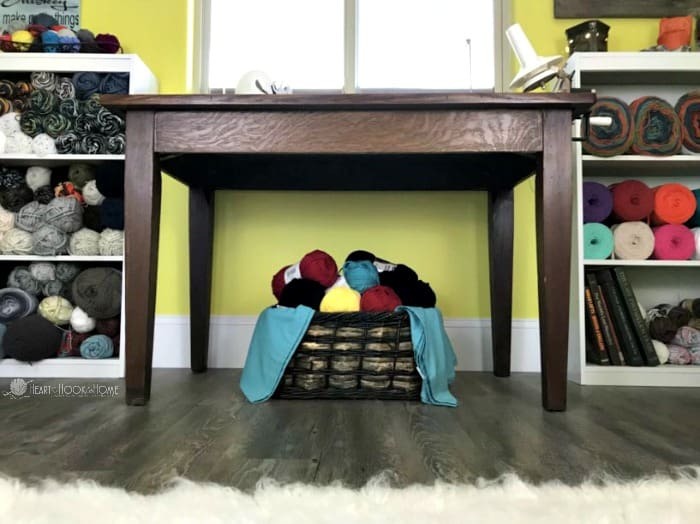 I wish I could give you a better tour of my yarn room and crafty space, but I do hope you’ve gotten a feel for where the magic happens as I’m creating new patterns and designs to share here on Heart Hook Home. Thank you for watching the weekly live videos, and I will see you in the weekly LIVE video next week! Thanks Ashlea for sharing your experience with us. I'm glad to have a tutor like you.one year ago I started crocheting.And I have a dream to make my craft room as yours.Thank you so much.lots of love from India. Hello. 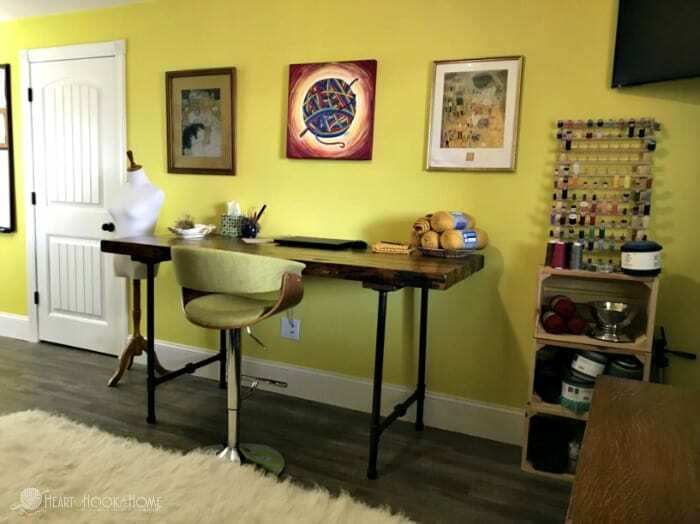 I love your crafty space. 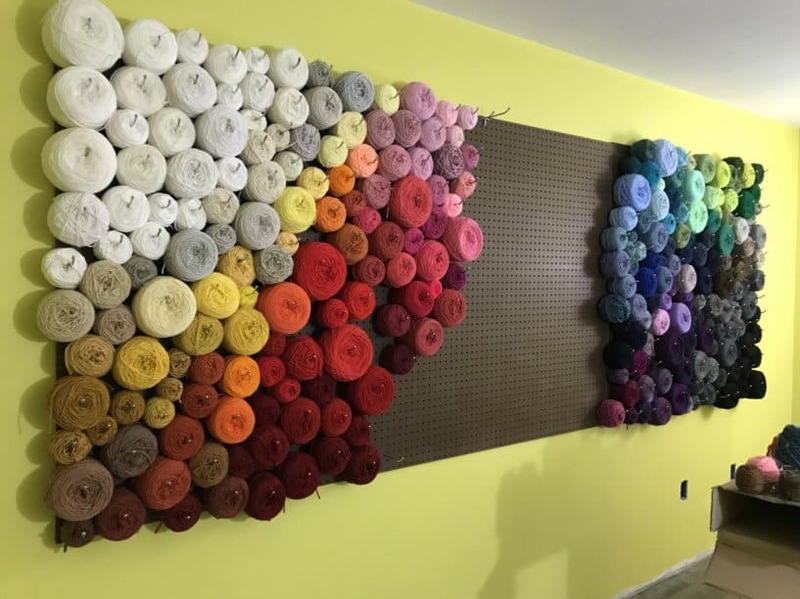 The yarn pegboard is just a wonderful idea. Question though, how do you label the yarn as to type and brand when they are rolled and hung? Beautiful happy space! 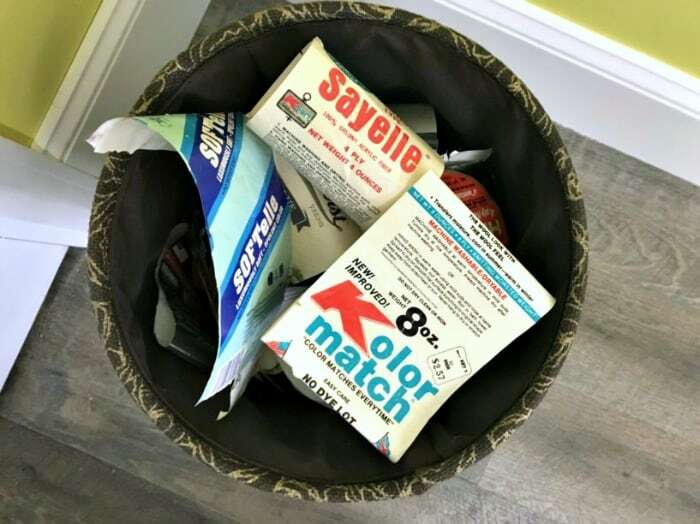 If you want you could roll up the label on the inside, or cut out just the part you need to save and hole punch and tie on the end. Love it! Thanks for taking a moment to leave the comment. ♥ Sounds like your mom was a special lady with a special gift! I love everything about this room! I have to share my craft room (as it doubles as a guest room) but I have incorporated several of your things in my room. 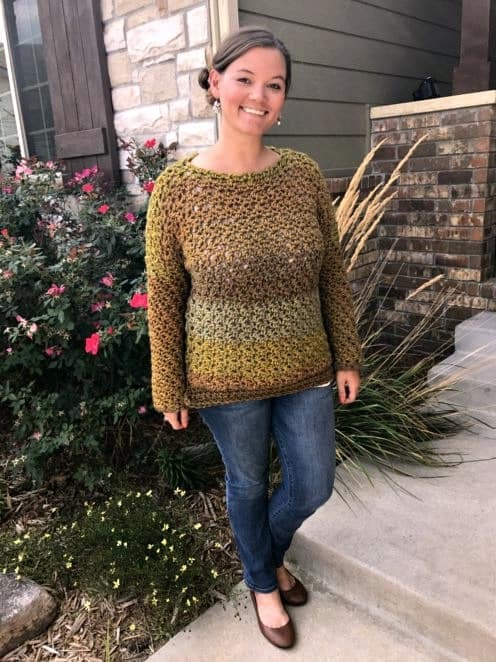 Thank you so much for sharing :) PS...I would love it if you could send me your Yarn Fund file so I can try to make it. Oh I love your space..it is beautiful and inviting. But I loved the memories you shared even more. My sister taught me to crochet when I was 8. We lost her 2 days after Thanksgiving 3 years ago to a sudden heart attack. When I crochet she is with me. So, blessed that's what she left me with. It is. I just wish I could share all these new things with her. She was my only crochet buddy.